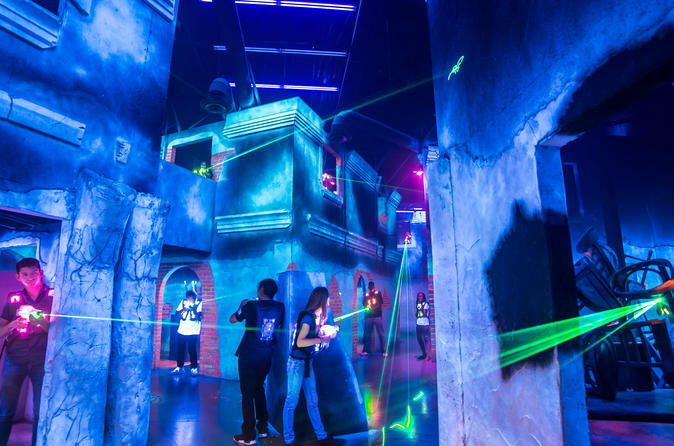 With this four-game pass, there's fun for the whole family at battleBLAST Laser tag. After a short introduction from a knowledgeable team member, you'll know everything you need to get suited up and start playing. You'll be battling in a wheelchair-accessible room that can hold up to 37 players. Everyone older than 6 years old is allowed to play, so parents and grandparents can join the fun too. Players begin their laser tag experience by entering the briefing room. This begins the instructional phase where a qualified staff member (Marshal) explains the equipment, game objectives and the rules. After players have been briefed, they enter into the vesting room. Laser tag games are run with up to 37 players at a time. The vests are designed to be put on like a coat with front clips and adjustable side straps, allowing players of all ages, size and physical ability to suit up without difficulty. The combined vest/phaser pack weight is an ultra‐light, industry low 5.4 lbs. Between laser tag rounds, hit the snack bar for some tasty treats or enjoy the action in the arcade and prize counter. Laser tag is great fun for families, groups of friends, sport teams, bachelor/bachelorette parties, corporate groups and team building.